A 36ft Fairline motor cruiser has sunk and two neighbouring vessels and a pontoon were damaged on Sunday evening after a major fire at Strood YC. Club members used a workboat to tow the burning cruiser away from the pontoon to prevent further damage to other vessels. The cause of the fire remains unknown. Fortunately it seems no-one was injured. Now for some good news. This is Sun Pier yesterday, looking good with new landing pontoon and bridge. Medway Council plans to have the pier in service by Easter 2014. The Hoo Freezer is back! Proposed Medway buoyage changes: what do you think? 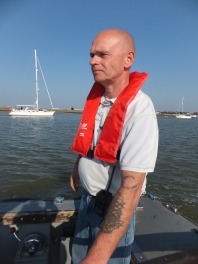 Deputy Harbourmaster John Gurton would like to know what we think about changing buoys 15 and 16 (green and red channel buoys between Oakham Ness and Bishop Spit) to quick flashing. It is suggested that this would reduce confusion with the other lateral buoyage. Use the Reply button to let us know what you think and we’ll pass your views on.